In 1957 Fiat joined the ranks of Europe's thrifty no-nonsense commuter cars with the Fiat 500. The affordable 500 was an air-cooled 479cc two-cylinder engine wrapped in a compact and nimble platform that was simply oozing with Italian style. Many consider the Fiat 500 to be the first cool "city car" and with production running through 1975, the numbers seem to confirm that notion. Fifty years later, nostalgia designs in the automotive industry are trending up and Fiat reintroduced the 500 a few years ago. The same compact, economical and practical design criteria were used as on the original car. The wild success of the Italian retro-styled 500 in the European market has poured over to North American markets, as Fiat now offers more than 5 different models in North America. With all the excitement and possibilities surrounding the Fiat 500, a retro styled whitewall tire seemed a natural fit. 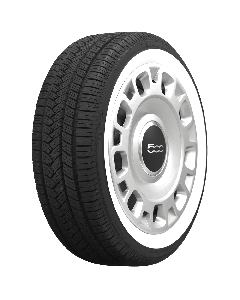 In the same ways that Fiat brought their classic into the 21st century, Coker Tire Company now offers a classic whitewall radial tire specifically for the Fiat 500. Get all the style and looks of an original bias ply whitewall tire with the safety and modern construction of today's smooth riding and long-wearing radial tires. The Pop, Lounge and some Sport trim level Fiat 500s now have a direct fit 1.6 inch whitewall tire designed specifically for them from American Classic in 185/55R15 sizes. The new American Classic tires are steel belted radials, with the same performance capabilities of the original tires on a modern car, such as the Fiat 500. The new American Classic radials feature a 1-5/8-inch whitewall, which adds a great deal of vintage flavor to this modern rendition of Fiat’s popular 500 series. The tires are H-rated (130mph) and feature an asymmetrical tread pattern, which works well in wet or dry conditions. Thoroughly developed and manufactured in the USA, these tires are in stock and ready to ship.